What would you engrave on this heart charm? Post your response in the comments below for a chance to win one of seven valentine locket & heart charm pendant kits from Nostalgems, CraftSanity’s episode 93 sponsor. The most endearing posts will receive a jewelry making kit including all the bits and bobs to make a romantic tandem of charms to add to your favorite necklace. 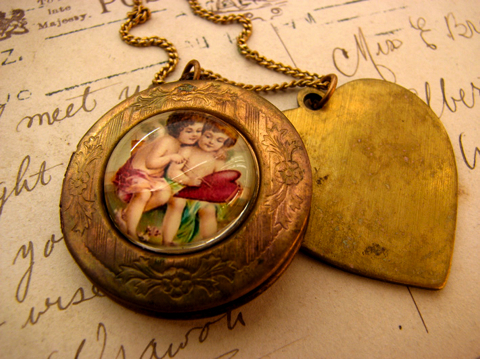 All you need to do is set the cupid image on the acrylic dome with craft lacquer and cement glue it on the locket setting. Thanks to Rina Ward for the giveaway and check out Nostalgems on Etsy for more great kits and finished products. Post your engraving ideas below by the end of Feb. 7 (Saturday) for a chance to win. Good luck!